← ‘Tis the Esher Season! Most fans know the general history of The Beatles arrival in America, The famous airport Press Conference where they totally won the press over, the jam packed streets outside the NYC Plaza Hotel, George had a fever and his sister Louise helped get him ready for the Sunday Ed Sullivan Shows, The photo jaunt through Central Park on Saturday, etc, etc. However, The Beatles had the Top two songs (I Want To Hold Your Hand & She Loves You and the Top 2 albums (Meet The Beatles and Introducing The Beatles) pretty much by the time they took the stage on February 9th. I was examining the Billboard Top 100 Charts from early 1964 and found quite a few not so well known tidbits. By the end of February, there were the earliest signs of the British Invasion to come – The Searchers (incl former FEST Guest Mike Pender) with Needle and Pins, Dave Clark 5 with Glad All Over and The Swinging Blue Jeans (incl former FEST guest Terry Sylvester) with Hippy Hippy Shake. However, it took a Lennon/McCartney penned tune – World Without Love by Peter & Gordon (many time FEST guests) to make it all the way to #1 by a Brit group other than The Beatles. It was in June, 1964. By mid March, there were 7 Beatles songs in the charts including My Bonnie with Tony Sheridan, which peaked at #26. #86 was a song by the Swans called The Boy With The Beatle Haircut. #87 was a different song called My Boyfriend Got a Beatles Haircut by Donna Lynn. The next week, The Four Preps had A Letter to The Beatles hit the charts at #87 , while The Carefrees (featuring Cher!!) saw their song We Love You Beatles entered at #73. We all know The Beatles had the Top 5 songs the first week in April, but they also had the Top 4 songs the week before! I found an unknown oddity the week of March 14. The Supremes had the #100 song with Run, Run, Run and it peaked at #94. This was 4 months BEFORE Where Did Our Love Go starting its climb to #1 that summer! On the album side, Meet The Beatles was #1 by the time they hit the stage on Feb 9th. By the time their third Sullivan show aired, they had the top 2 albums (Introducing The Beatles). That remained #2 for 9 weeks behind, you guessed it – Meet The Beatles. 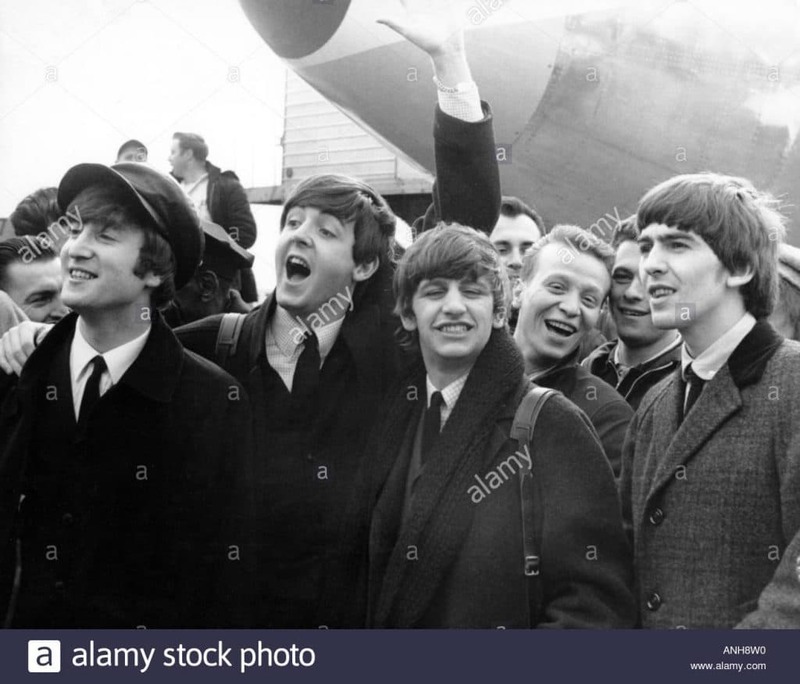 The Beatles spent 30 weeks in 1964 at the top of the Billboard Top 200 Charts (11 weeks for Meet, 5 weeks for 2nd Album and 14 weeks for A Hard Day’s Night). In February, Peter, Paul & Mary had 3 albums in the top 20, but folk music peaked and the British Invasion began its amazing run. Newcomer Barbara Streisand had her first two albums in the Top 10 and thus, began her historic career at the same moment in time The Beatles did, in the U.S. So, as Top 40 radio was playing a Beatles song every other song, all over the country, another historic event happened. It also took place in Miami Beach the same time The Beatles were there. U.S. Olympic Boxing Gold Medalist in 1960, Cassius Clay stunned the boxing world by knocking out heavyweight champion Sonny Liston. Of course, the world would come to know him as Muhammad Ali. The Beatles became the most famous people in the world for the rest of the decade and WAY beyond, even 55 years later. Muhammad Ali was right behind them in world celebrity. 1964 was the year! I remember it well.